When thinking of compounding, most people think of just reinvesting their profits/dividends they have received. I call that one-dimensional compounding. But in real life, you will have cashflow coming in the future. When I was saving for my financial freedom fund, I was waiting for commissions from real estate sales. Generally, I had to wait 3 months until I received those earned commissions on my bank account. I always kind of got frustrated that I could not immediately put those funds to work and buy more dividend stocks. That was until I learned that I could actually make more money by leveraging this anticipated income. I discovered that I could write put options for this income I was anticipating. On average I could make around 1% per month on this amount. Annualized, these are returns between 10-20% or sometimes even more! It even got better when I saw that most of the time I never actually had to buy the stock and put all the option premiums in my pocket. Maybe you never really thought about the fact that cash that you will be receiving in the future can actually have a great impact on your investment return. 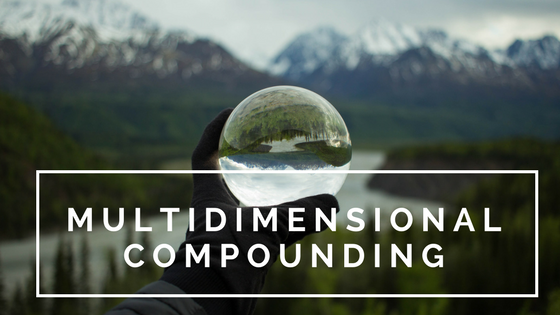 As I kind of discovered this concept of what I call “multidimensional compounding”, I started to look at other sources of future income. So I started to make a Microsoft Excell sheet with all my stocks and a calendar when they would pay their dividends. I combined my anticipated dividend income with other sources of future income. This way I had a very detailed overview of how much income I was anticipating. I have to note that my living expenses were pretty stable at that time. Look at bonuses, commissions, tax returns, future (holiday) rental income, your birthday (and your wealthy aunt is coming). Do I need a margin account for writing options on money that I don’t have yet? And isn’t that dangerous?